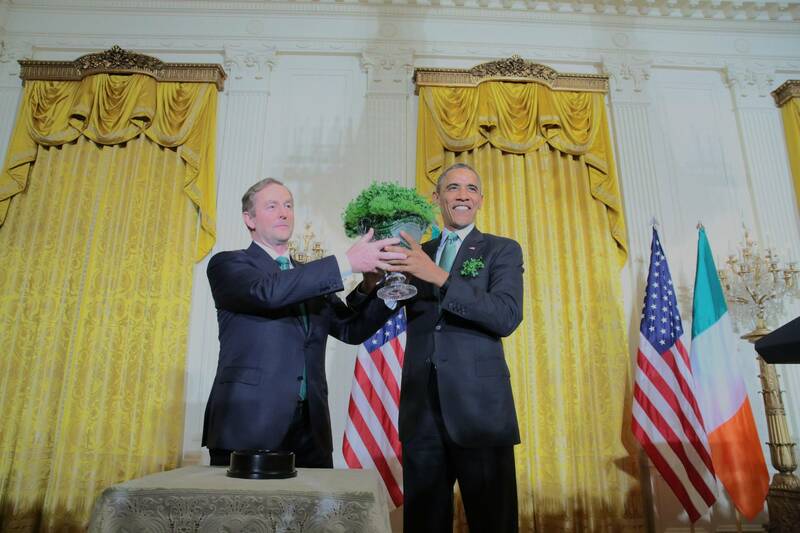 For St Patrick’s Day 2015, Irish Taoiseach Enda Kenny presented President Barack Obama an engraved Waterford Crystal bowl inscribed with the poetry of W.B.Yeats. The second-term American President and his Vice-President Joe Biden also received handcrafted books of Yeats’s poems. His daughters were similarly honoured. The presentation comes in recognition of Yeats2015, the 150th anniversary of the poet’s birth, which has seen a programme of local and international events, including the restoration of Thoor Ballylee. St Patrick’s Day also for the first time saw the launch of online donations to the restoration of Thoor Ballylee, a project conceived and supported by the Yeats Thoor Ballylee Society. This important building with Yeatsian connections will be at the heart of Yeats2015 celebrations. Yesterday wasn’t the first time Yeats has been into the White House – he stopped by to take lunch with American President Theodore Roosevelt on December 28, 1903. Yeats was also on intimate if sometimes oppositional terms with a couple of British Prime Ministers, swapping poetry with Herbert Asquith, and urging David Lloyd George not to introduce conscription in Ireland in 1917. Yeats himself served on the Irish Senate following independence in 1922 and was lifelong friends with President Douglas Hyde. Further details on the gifts and story can be found in the Irish Independent.